This time last year, I was conditioning Kylie to return to agility after surgery to repair her torn cruciate ligament in her right knee. Kylie was so sad to sit on the sidelines and watch me work with Maizey, but we had to take our time and make sure her healing was complete. This involved doing special walks, trips to Hydropaws for physical therapy and underwater treadmill sessions, walking in the sand on the beach and up hills to strengthen her body again. Kylie was such a trooper through it all, and I could tell that what she really wanted was to run on the beach with us and play her favorite sport again. Cautiously we began agility in very small increments, making sure Kylie was ready for each little step before progressing to the next one. Kylie was trying to show me she was more than ready, but it took quite some time to convince me of the same thing. Once we were given the green light, I started showing Kylie in Jumpers classes only, and then we would add in a Time to Beat here and there. Since all of that went well, we added in Standard too – and Kylie got her crazy agility grin back and was barking up a storm on course again. Because we had taken over a year off from agility, Kylie missed many months of qualifying in AKC. She seemed to catch right up, and earned her MACH 2 title in August and is very close to MACH 3. 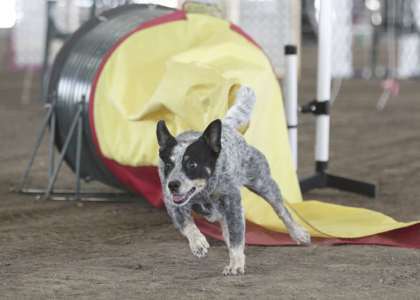 Kylie was also the #1 ACD in Agility at our national breed specialty event this past October. In checking the statistics, Miss Kylie is the #3 ranked Australian Cattle Dog in AKC Agility for 2013, good girl!! She thinks it should be higher, but I tell her that with what she has been through, she is pretty awesome.